Interview conducted by Tony Macklin. Audio interview originally published on June 18, 2009 @ tonymacklin.net. 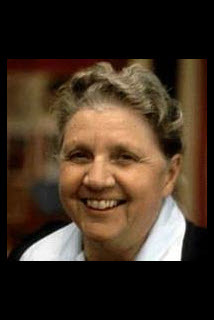 Listen to an audio interview with Leigh Brackett (MP3 format, approximately 70 minutes). My interview with author Leigh Brackett took place in Kinsman, Ohio. I drove with my young daughter on a hot, humid, blazing July 1975 day to Leigh's rural farm house. She was a gracious hostess and introduced us to her husband, fellow science fiction author Edward Hamilton. A lot of heady imagination was born in that rural locale. I vividly remember Leigh's making us lemonade to help cool us -- it was pure sugar. My teeth still cringe when I think of it. On the way home we stopped in the woods by a lake and took a refreshing dip in the warm water. The whole trip was like a trip to an alien world, where we were welcomed by a fairy godmother.